Amz Blog | The Pink Margarita | LalalaPatricia | Stella Jezebelle | Janelleski | Makeup by Raych | CandyLoveArt | Makeup Artistry by Pretz | Frozen Blossoms by Senzy | Jannieology | MitchieKyuti | YettezkieDoodles Since we owe the 12-month year, we 12 beauty bloggers decided to merged for another Pre-Christmas Giveaway! 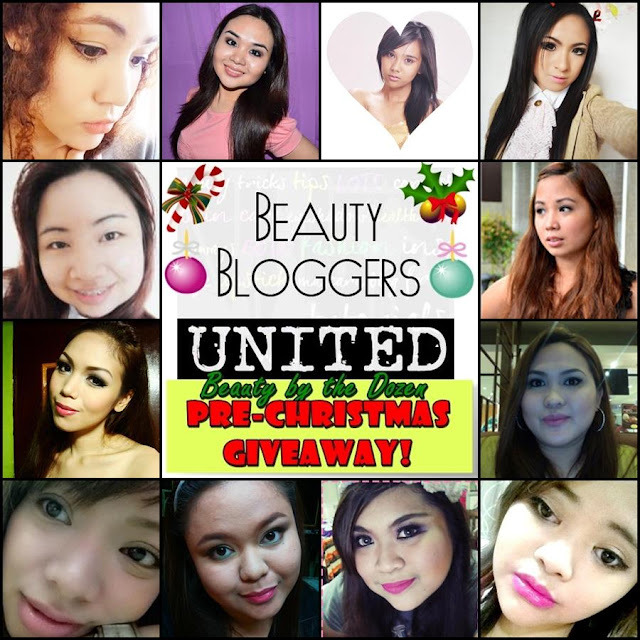 You have 3 weeks to join and 5 mega lucky winners from the Philippines will win these fabulous prizes! Aren't you guys excited for the grand giveaway? Here's how to join. Make sure to follow all bloggers via Networked Blogs, Tumblr or Google Friend Connect (This is mandatory. Failure to do so will make your entry null and invalid). Like all Facebook pages of sponsors and bloggers. Tweet about the “Beauty by the Dozen Pre-Christmas Giveaway” and use #BBUChristmasGiveaway. Leave a Blog Post Comment with your Name, Email, Twitter, Facebook, Tumblr and GFC Name. Five (5) winners will be drawn on December 15, 2012. Winners will be contacted through email.